I recently wrote about Romans 13 and the state. I mentioned that I did not believe that text was even about the Roman government. I believe, based upon the evidence I have seen, that Romans 13 talks about reconciling Jewish and Gentile Christians in relation to the religious, community authorities. Tyler Tully picked up on this and wrote a far more detailed analysis of this here and here, which I strongly recommend reading. I was not raised in the Christian religion. Like many from the First World, I was raised in a Christian culture, but I was not raised in the church or with a knowledge of the Christian religion. I spent most of my childhood as an agnostic with some Buddhist flavor, and when I was exposed to the Bible, it was through a children’s storybook. As a result, I associated the Bible with fairy tales. This would eventually come to change as I felt the desire to actually study religion. Part of it due to my brother’s influence. My brother was like me. He was not raised in Christianity, but later converted to it as a teenager. He originally came to Christ through the Pentecostals, then he became an Evangelical. It was when he was attending an Evangelical Free church that I first came to truly appreciate Christianity again. It was also during this time that I got my first Bible, which was the New Living Translation. I did not believe in Christianity during this time, but it was something interesting to study and do on the weekends. One thing that I learned from Evangelical Protestantism was that everything is personal and private. We are supposed to have a personal relationship with Jesus. We are supposed to personally convert to Christianity, and salvation was all about personal redemption from sin and death. Even the Bible was to be read and interpreted privately. Even in economics, Evangelicals tend to stress capitalism and enterprise over community and charity. Then, I began to study Catholic theology, and I started to use a New American Bible. We are Mennonites (and fellow travelers) who reject the church’s mission activities. We believe Christian mission, historically, goes hand-in-hand with cultural destruction. We love human diversity and seek to preserve it. Thus, we oppose evangelistic crusades and mission boards that proselytize, no matter how well-meaning they claim to be. We reject the authenticity of the so-called “Great Commission” (Matt. 28:19-20). We simply don’t think Jesus said it. Most New Testament scholars doubt its authenticity as well, for a couple reasons. Firstly, any statements supposedly made by Jesus after his death must be called into question. Secondly, if Jesus told his followers to go out and convert the world, then the debate about the inclusion of Gentiles during Paul’s time makes little sense. To modern scholars, the “Great Commission” sounds more like the post-70-A.D. church talking than the historical Jesus. The Sermon on the Mount is defined as the 40+ sayings of Jesus found in Matthew 5, 6 and 7. About half of those sayings are considered by scholars to be non-authentic (meaning they were likely created by the early church rather than originating with Jesus). Non-authentic sayings are not included here. Most Sermon sayings have parallels in other gospels (Mark, Luke & Thomas). Sometimes the parallels are in simpler form, and thus probably closer to what Jesus actually said. Listed below are 21 of the most authentic Sermon sayings, along with Torah passages that Jesus probably had in mind when formulating them. Similar sayings from other traditions are offered as well. We are Marginal Mennonites, and we are not ashamed. We reject all creeds, doctrines, dogmas and rituals, because they’re man-made and were created for the purpose of excluding people. Their primary function is to determine who’s in (those who accept the creeds) and who’s out (those who don’t). The earliest anabaptists were also non-creedal. We are inclusive. There are no dues or fees for membership. The only requirement is the desire to identify oneself as a Marginal Mennonite. We have no protocol for exclusion. We reject missionary activity. Christian mission, historically, goes hand-in-hand with cultural extermination. We love human diversity and seek to preserve it. Thus, we oppose evangelistic campaigns and mission boards, no matter how innocuous or charitable they claim to be. In January I saw an article in the Wichita Eagle about a woman who was thoroughly convinced that the rapture and the end of the world would be on May 21, 2011. At 6pm to be exact. Well, this Saturday is the fateful day and, as one would expect, the story has been picked up by various news outlets. Now forgive me if I sound a little cynical, but I know my history. From the very first moments that Jesus walked the earth people have been predicting his return, and thus the end of the world with it. So far, no one has been right. What’s more, I know what happened at Münster. To recap, a group of Anabaptists violently took over the town of Münster and swiftly began killing people, running around naked and doing a whole bunch of other things all because they were certain that Jesus was coming back right then and there. Is Gandhi in hell? What’s more, what is hell? Or heaven, for that matter? These are some of the questions that have sparked a bit of a firestorm around Rob Bell’s new book Love Wins: a book about heaven hell and the fate of everyone who ever lived. This first came across my radar screen when I read a post on Tony Jones’s blog late last week about the growing attention and criticism about this book. Then I did some searching and saw that it has even made a splash on the national news scene from CNN to ABC. Controversy in and of itself isn’t surprising with Rob Bell. That’s happened before. What is striking is that judgment has been leveled by a number of people who haven’t even read the book yet because it has not yet been released! 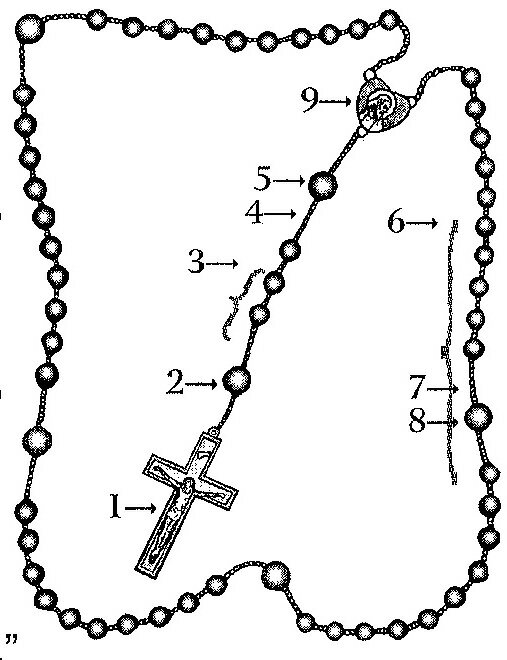 So I’ve recently run across the Catholic Rosary. While I’m drawn to it’s structure and it’s ability to help people pray, as a good Anabaptist, I take issue with some of it’s theology. So here is my initial thoughts and proposal for an Anabaptist Rosary. First- An orientation to the actual Rosary. 6. Say ten “Hail Marys,” while meditating on the Mystery. 8. Announce the Second Mystery: then say the “Our Father.” Repeat 6 and 7 and continue with the Third, Fourth, and Fifth Mysteries in the same manner. 9. Say the ‘Hail, Holy Queen’ on the medal after the five decades are completed. A high church Reformed Anglican bishop, NT Wright, has just written a book called Justification, which (as you can guess) is a summary of his thought on this much-debated issue within the Western Christian world. His impetus for the book is a book published in 2007 by Dr. John Piper called The Future of Justification which probes the underpinnings of Wright’s understanding of Paul and if this is a helpful or harmful understanding. For years, I’ve gotten a sinking feeling in my stomach as the month of November draws to a close and this day looms. On the one hand, Thanksgiving is about joy and gratitude. It is a time when I travel to see family and friends, welcome a few days of rest and look forward to the holiday season. In my mind, I know it is a good thing to have a day where the sole emphasis is to give thanks to God for all God has done. I also appreciate the opportunity to celebrate all my loved ones do and are to one another. In class we’ve been studying a lot about New Monastics. Lots of good stuff that you can read about it in many places, some even on this blog. Since it’s a fluid movement, I was wondering when they are going to update, change, or adjust their 12 marks. I have some comments on a few, and I’m sure others do as well, so when is the next conference? Or do we just email somebody like Johnathan W-H?